Ransoms for Hostages: What are the Real Costs? Home Foreign Affairs Ransoms for Hostages: What are the Real Costs? Recent attempts to compare Bill Clinton’s successful freeing of two Al Gore reporters by North Korea and George Hansen’s efforts to free American embassy personnel from Iran thirty years ago have been high on hyperbole and short on fact. Since both events have national security implications, a more thoughtful review is warranted. After allowing Bill Clinton to bring Gore’s reporters home with him two weeks ago, North Korean press reported that Mr. Clinton conveyed a message from Mr. Obama “expressing apologies … profound thanks … and ways of improving the relations between the two countries.” Obama refutes those claims, though they are likely true given the President’s propensity to apologize to the world for America’s “evil” acts around the globe. The situation with Iran during the Carter administration was significantly different. When Carter arbitrarily cancelled a rural stabilization program for Iranian mullahs, undermining our ally the Shah, the retributive Ayatollah began systematically withdrawing the $2.5 billion in deposits from Chase Manhattan Bank. As the withdrawals diminished deposits to levels dangerously close to what the bank had loaned to Pahlavi’s regime, the bank feared the new regime intended to default on the loans. Carter, after allowing the Shah to fall, allowed him into New York for medical treatment. This prompted the Ayatollah to extol Iranian revolutionary students on 11/1/79 “to extend with all their might their attacks to force the U.S. to return the deposed and cruel Shah.” Just three days later the students carried out the Ayatollah’s suggestion by storming the U. S. embassy and taking 66 hostages. Ten days later, after Chase Manhattan Bank importuned to the President, Carter froze all Iranian assets in the U.S., allowing Chase to cover their Iranian loans, and then some. Iran wanted to expose the banking corruption during the shah’s regime. With backing from his Democrat chairman of the House Banking Committee Hansen went to Iran armed with a proposal to conduct congressional hearings exposing the corruption. Bani Sadr, who later became President of Iran, told Hansen they would free the hostages, and allow him to take some home with him, if they were promised congressional hearings, and jubilantly reported the agreement with Hansen on live Iranian radio. Carter, however, nixed that possibility and a UN investigation when he declared that there “will be no hearings … I want the hostages.” Carter by blocking the possibility of hearings scuttled what the Washington Post called “the only proposal that ever had a chance” of freeing the hostages. 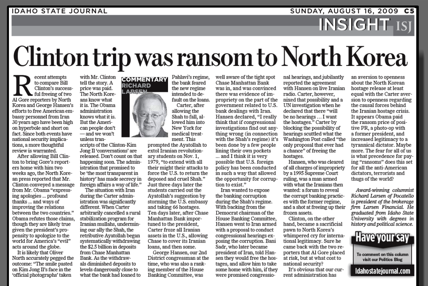 Clinton, on the other hand, became a sacrificial pawn to North Korea’s whimpered cry for international legitimacy. Sure he came back with the two reporters that Al Gore placed at risk, but at what cost to national security? It’s obvious that our current administration has an aversion to openness about the North Korean hostage release at least equal with the Carter aversion to openness regarding the causal forces behind the Iranian hostage crisis. It appears Obama paid the ransom price of positive PR, a photo-op with a former President, and increased legitimacy to a tyrannical dictator. Maybe more. The fear for all of us is, what precedence for paying “ransoms” does this set for all the anti-American dictators, terrorists, and thugs of the world?